I needed inspiration for today’s post and my friend Ana Elisa sent me the link for Serious Eats’ “the best cupcakes in New York City” slideshow. 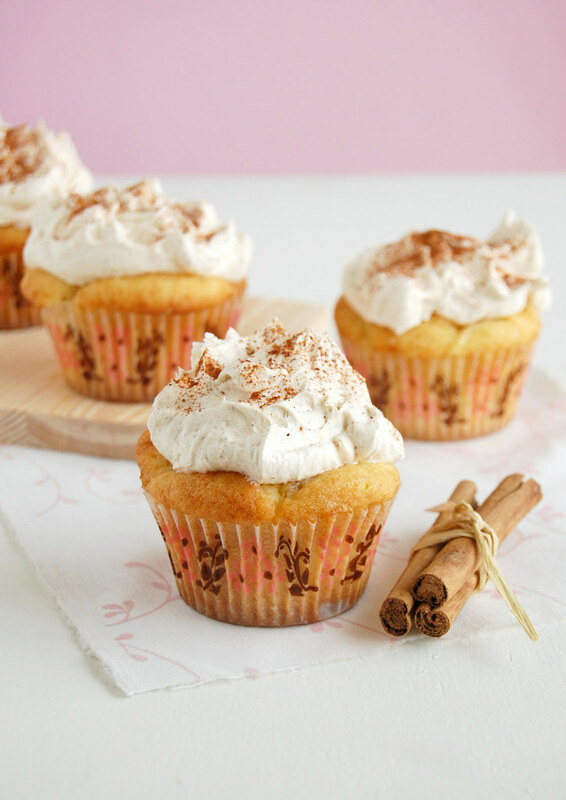 I took a look but did not feel very inspired – so let’s call it for the day and have some apple pie cupcakes. Make the caramelized apples: place the butter and sugar in a large frying pan over low-medium heat and stir until dissolved. Add the apples and cook for 8-10 minutes or until golden and caramelized. Remove the apples from the pan and allow to cool completely. Preheat the oven to 180°C/350°F. Place the butter and sugar in the large bowl of an electric mixer and beat until light and creamy. Gradually add the eggs and beat well. Sift over the flour and baking powder and beat until combined. Fold through the milk and spoon the mixture into two 12-hole ½ cup capacity muffin pans lined with paper cases. Top with the apples and bake for 15-20 minutes or until golden and cooked when tested with a skewer. Cool on wire racks. Make the whipped cinnamon icing: place the butter in the bowl of an electric mixer and beat for 5-6 minutes or until light and creamy. Add the sugar and 2 teaspoons cinnamon and beat for 10 minutes or until light and creamy. 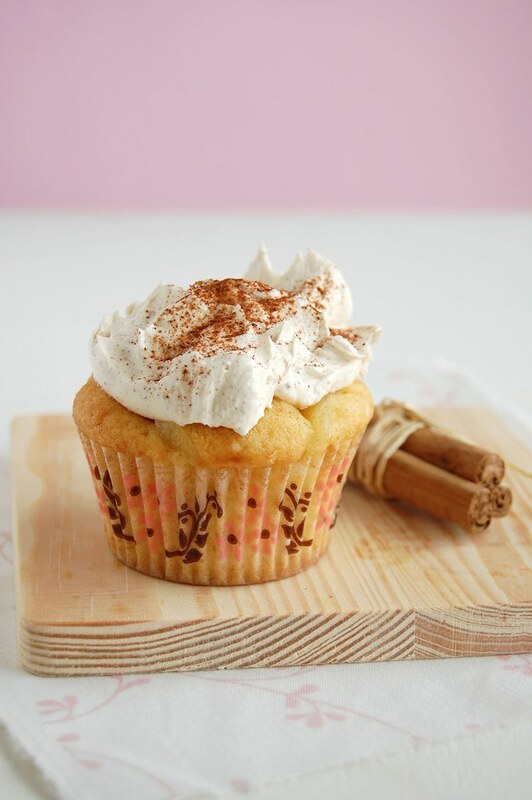 Using a palette knife, ice the cupcakes and dust over the 1 tablespoon cinnamon. They look amazing! And your photos are absolutely GORGEOUS! Okay, those are beautiful! These have been bookmarked! I can't wait to try these! Such an original idea! Love it! Beautiful cupcakes, they look perfect for fall. Apples and cinnamon is always a fall favorite for me. I'll have to try these beauties then. There's something so much more appealing about apple pie cupcakes versus apple pie! wow, you're sending one great post after another! these look heavenly! and i like the name too apple pie cupcakes! bookmarking this now! thanks for sharing! This recipe itself is an inspiration, Pat! Yum! My idea of cupcake heaven! This sounds like just my flavor. The goodness of apples in cupcake form. Suddenly, I'm hungry :). they look beautiful + delicious. thanks for sharing! Wow, even if I haven't been checking blogs for a long time, I still remember yours. You're my true inspiration. Just love your blog! Do you have any recipe for madeleines?? Susan, hope you give these a go, darling! Mary, thank you very much! I'm glad you like them! Foodies at home, thank you for stopping by! Torview..., I love cinnamon, too. Tks! Amanda, thank you! I hope you give them a go. Jane Ko, thank you for letting me know. Faithy, thank you for stopping by! Anh, you're too sweet - thank you! FFichiban, thank you for stopping by! I have tons of madeleine recipes, take a look at my index, I think you'll like it! That whipped cream topping looks scrumptious! i saw this recipe on tastespotting.com and it looked amazing!!! so i made it!!! absolute hit with my family :)Thanks!! Hi, Anonymous! I'm so glad to hear the recipe worked out for you - thank YOU for letting me know! Priscilla, thank you for your comment! I think the batter is firm enough to be baked in a larger pan, but do not know the size... Unfortunately. I think you could pour the batter into the pan and layer the apple sliced on top of the batter. Oh my! These muffins are simply adorable. And the muffin papers are wonderful. Lovely photos, as always. - for the batter, I added roughly 1 tbsp cinnamon, 1/2 tsp allspice, 1 tsp cloves, 1 tsp ginger, and 2 tsp nutmeg. As well, instead of the cup of whole milk, I used 1+3/4 cup skim milk and 1/4 cup plain yohgurt with lemon juice to make a buttermilk-type mixture. - for the icing, I substituted half the butter with light chream cheese and added a dash of vanilla flavouring, only 1+3/4 c. icing sugar, and 1/4 c. maple syrup. Dear Anonymous, that is great news! I love each and every thing you did to the recipe - yum! I'm a sucker for all things maple syrup. Thank you for letting me know and sharing the tips with my readers! I can't wait to try this recipe and the apple bars recipe. Thank you.